I'm trying to remember how it got started. 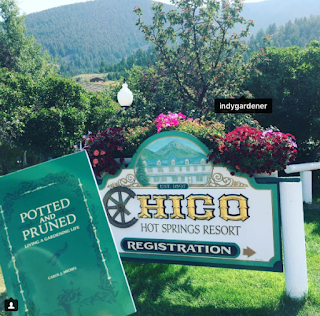 How it became "a thing" for my friends and family, and sometimes me, to post pictures of Potted and Pruned: Living a Gardening Life at locations literally around the world. 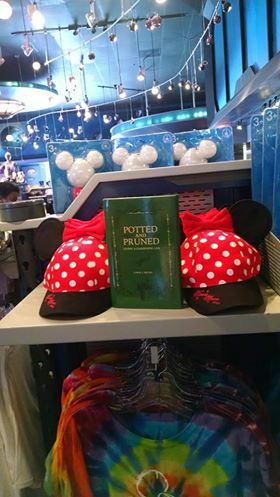 Perhaps it started with this picture that my niece and her husband took of Potted and Pruned living it up at Disney World in Orlando, Florida earlier this spring. 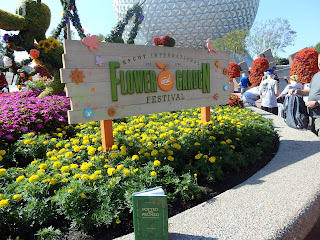 There was also a Flower and Garden Festival going on at Epcot when Potted and Pruned was there. I'm sure my book enjoyed it. It looks happy there on that ledge, doesn't it? Maybe someday I'll go to the Flower and Garden Festival at Epcot and see if it is as much fun as it looks. 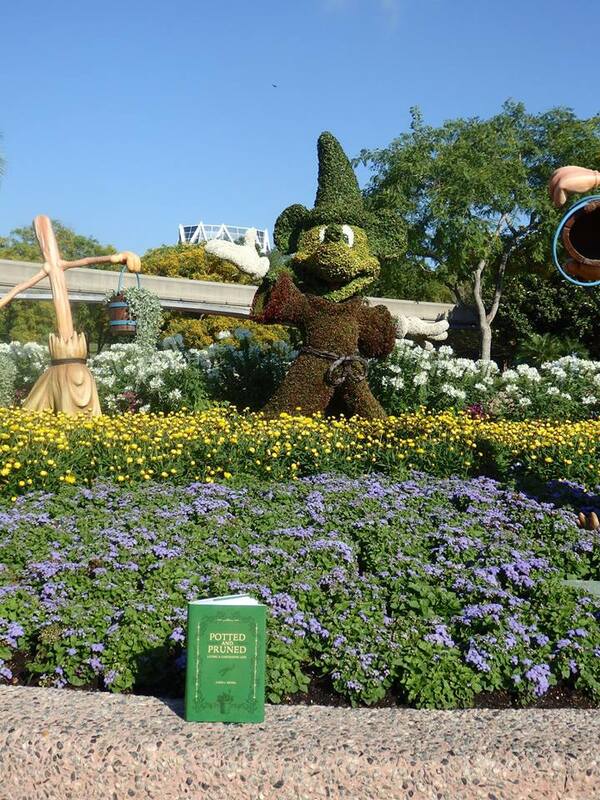 Potted and Pruned finished its trip to Orlando with this scene. I sort of feel like it was almost taunting me. Then later this summer, my friend Mary, who is also retired, posted pictures of Potted and Pruned on its visit with her husband to Disneyland. But that's not all the places my book has been. 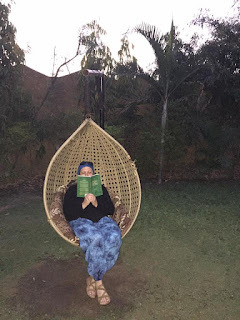 Good friend and fellow writer/blogger/gardener, Janet, took it to India where it spent some time in the Bandavagarh Tiger Preserve Forest. 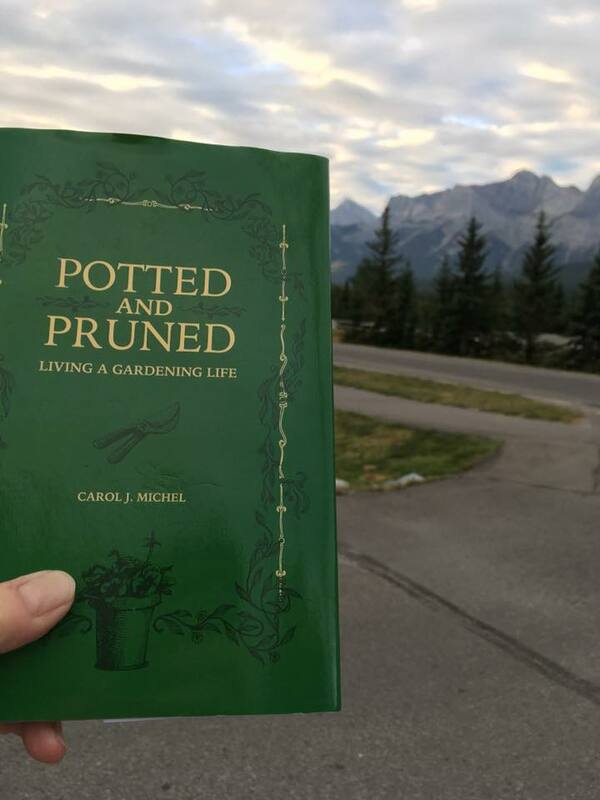 Later, she took Potted and Pruned on a train ride through India. Potted and Pruned also apparently went to England this summer on a garden tour with some of my friends. Here it is in a garden shed at Hidcote, admiring old tools and other gardening artifacts. 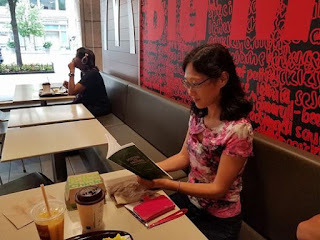 Thanks, Cindy, for the picture. And then some of my British and American gardening/blogging pals (Victoria, Mary Ann, Michelle (reading! 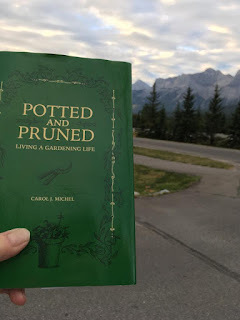 ), Layanee, and Cindy got together to read Potted and Pruned in a British garden. 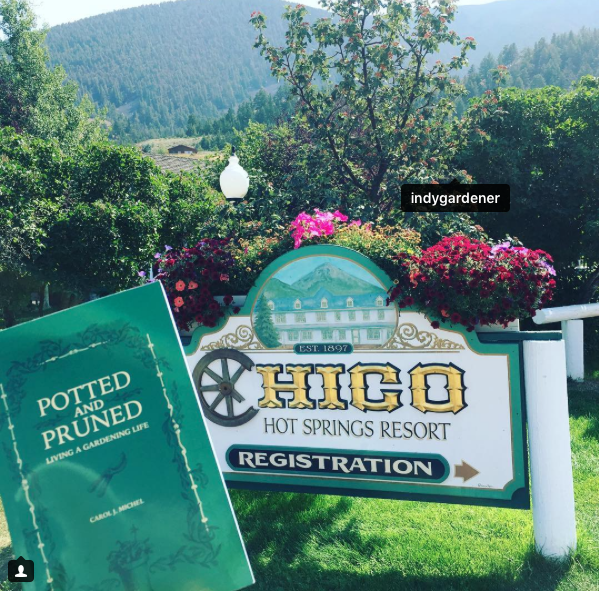 Back stateside, Debra Prinzing of SlowFlowers took my book to Montana. I've never been to Montana! But my book has been to Montana. Oh and I've never been to the Canadian Rockies, either. But Potted and Pruned went there earlier this summer. 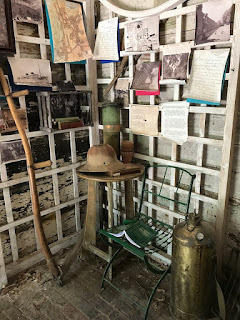 It went with Jo Ellen, the Hoosier Gardener. It apparently flew through the Spokane, Washington airport to get home from there. 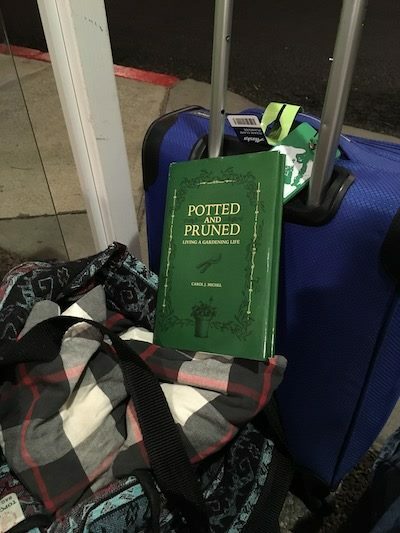 Speaking of airports, Potted and Pruned was spotted in this airport being read by who knows who that is? Teresa W. snapped the picture on her way home from Buffalo, NY to Florida. 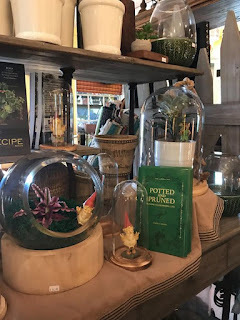 My friend Mary Ann took Potted and Pruned to coastal Oregon, a place called Yachats. On the way, she also took it to Sisters, Oregon. 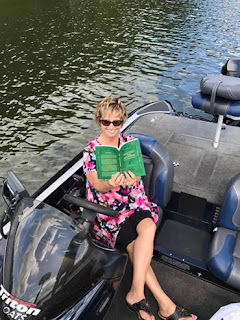 I personally took my book to Niagara Falls, Canadian side. Do you recognize that hand? That's my good friend Deb's hand. 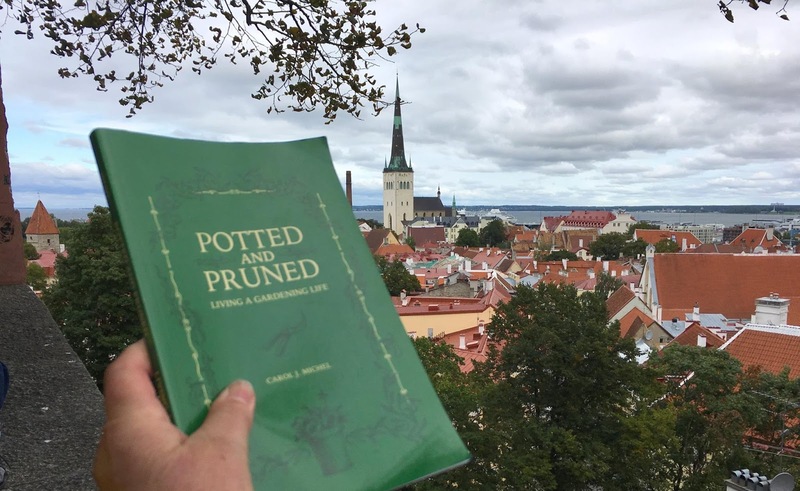 She took my book to Estonia and Russia earlier this month. Here she's holding Potted and Pruned in Tallinn, Estonia with the Old Town skyline in the background. 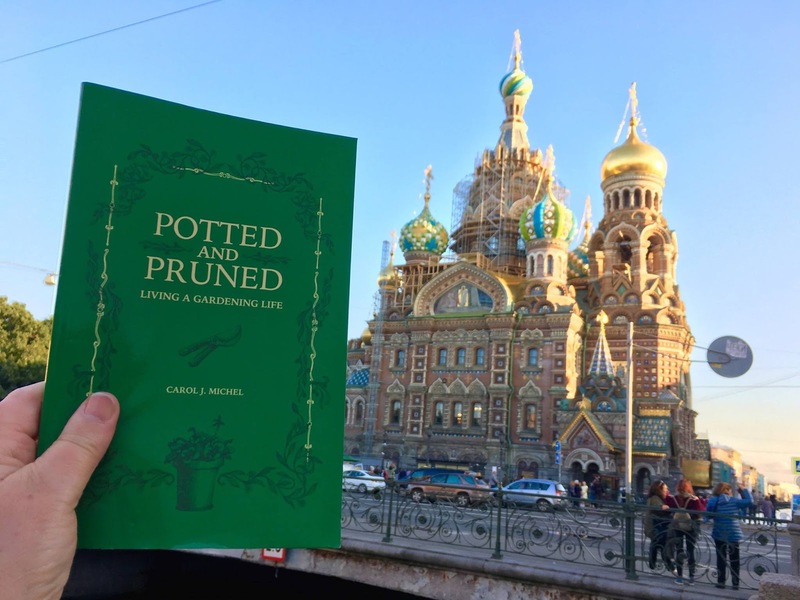 And here Deb is accompanying Potted and Pruned to The Church of the Savior on Spilled Blood in St. Petersburg, Russia. She said the spilled blood is Alexander II's spilled blood. Of course, not all the trips Potted and Pruned takes are to such exotic places. 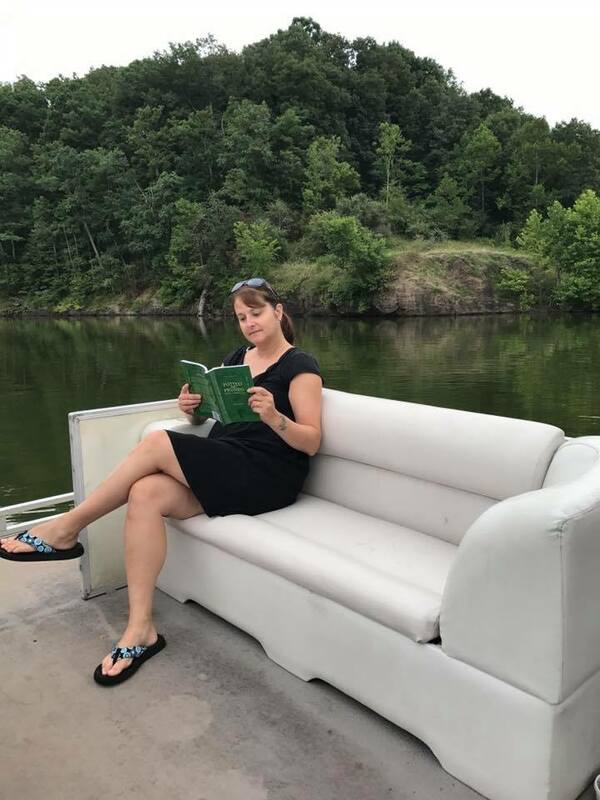 Sometimes it just goes to the lake, like in this picture my friend Pam posted on my Facebook page. And friend and fellow writer/blogger, Jessica took it with her to a lake, too. Goodness gracious. Potted and Pruned also ended up at both Enchanted Gardens and Enchanted Forest gift shops in Texas. I guess technically speaking because they were for sale there, it was a working trip. 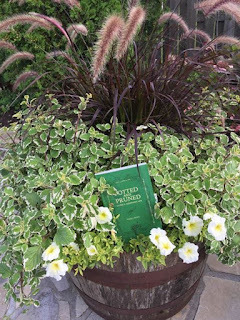 Sometimes Potted and Pruned visits someone's home, like in this picture where it is at Theresa's in Niagara Falls, Ontario, Canada. Theresa is a fabulous freelance photographer. And just today, Potted and Pruned was spotted in Long Island, New York, helping another friend pick out plants for a commercial. I've probably missed some of the pictures of Potted and Pruned as it travels around the globe having its picture taken. They just show up on my Facebook page! 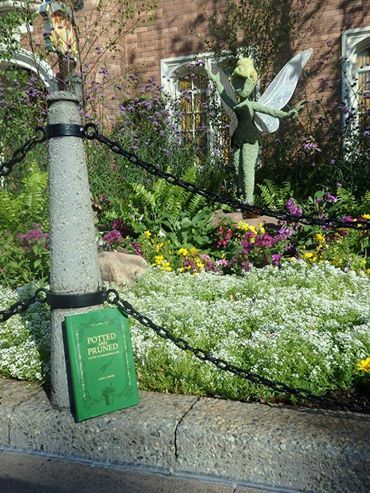 But I'm not one bit jealous of my book and its travels. After all, that's why I wrote it. 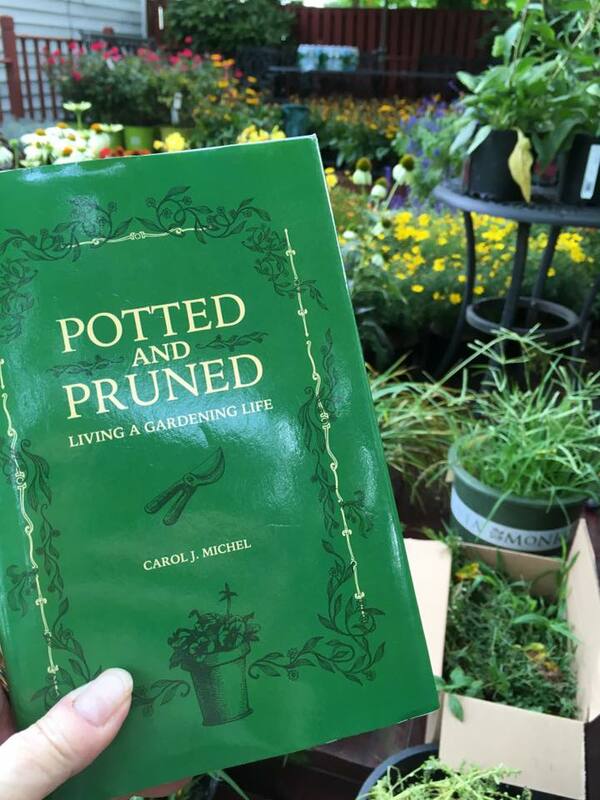 I want everyone to be able to experience the love and humor that gardening will bring to their lives, no matter where they garden. So, Dear Reader, if you happen to have found my book in some exotic or even a not-so-exotic location, please send a picture. I'd love to see it! 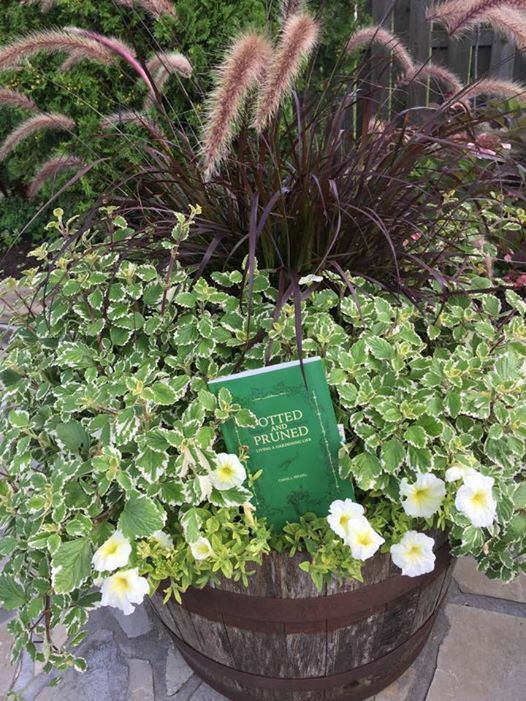 Loved seeing where your book has been..